This portion of the day is ideal for getting children up and moving. Tell them, "You are inside a dinosaur egg." (Children curl up as tightly as they can). "You are moving around to crack the egg." (Children wiggle around but remain curled up). "Poke your head out of the egg." (Children raise their heads and upper bodies). "The dinosaur is growing." (Children stretch and return to standing positions). Ask children what kind of dinosaur they were mimicking. To guide you in your discussions about dinosaurs, we have prepared a simple game to explain, with pictures, the difference between herbivores and carnivores. (Open dinosaur diet) Print, laminate and attach Velcro to the pictures. Have children associate the pictograms to the correct card. Cut out the different dinosaur tracks. (Open dinosaur tracks and dinosaurs) Glue the tracks on the floor to create a path. Have children follow identical tracks to discover which dinosaur they belong to. Be sure to glue the corresponding dinosaurs at the end of each path. Paths can lead to the bathroom, to the sink, etc. Create giant blocks using empty cardboard boxes covered with wrapping paper. Build (or have children build) a mountain for the dinosaurs....if you have the time, paper mache is child's play. Various objects which can be dipped in paint to create dinosaur tracks. In stores you can find animal footprints specially for stamping. The archeologist: a hat, beige colored clothing (shirt and short), sneakers, different accessories (binoculars, tweezers, camera). Different lengths of string representing the actual size of dinosaurs...to make comparisons, include strings the length of cats and dogs too. Children will understand just how big dinosaurs really were. Water table: add aquarium pebbles to create a lake. Use miniature dinosaurs. Cut styrofoam plates or trays to make islands. Sand box: children play the role of archeologists and dig for bones you have hidden. They can retrieve them with tweezers and then clean them with paintbrushes, etc. Use plaster to make an impression or to shape a dinosaur tooth. Make a mould in sand and pour plaster into it. (Open activity sheet pre-writing D) Print one sheet per child. 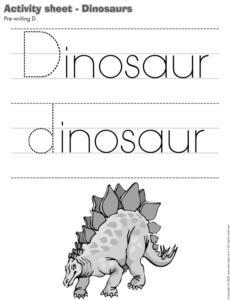 Children trace the letter "D" in the word "dinosaur". The pictures may be used as a memory game or to spark a conversation with the group. Use the pictures to decorate the daycare or a specific thematic corner. (Open picture game - dinosaurs) Print, laminate, and store in a "Ziploc" bag or in your thematic bins. (Open hunt and seek dinosaurs) Print and laminate. Children pick cards and search for the elements in the prehistoric décor. Hide plastic dinosaurs in a sandbox. With a brush, children dust the sand in search of the hidden dinosaurs, just like archeologists. Cut out the dinosaur bones (Open dinosaur bones) Hide them throughout the daycare. When children find a bone, they deposit it on a table. 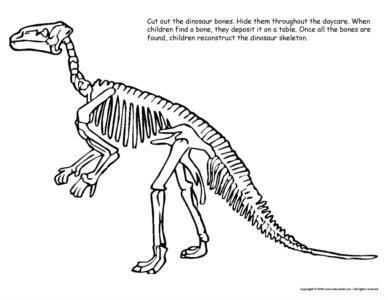 Once all the bones are found, children reconstruct the dinosaur skeleton. Show children different dinosaurs (picture game or plastic dinosaurs). Next, place them on a table and cover them with a blanket. Have children close their eyes. Remove one or more dinosaurs depending on the level of difficulty you feel appropriate. Take away the blanket and have children guess which dinosaur is missing. Hide plastic dinosaurs within the daycare. Upon your signal, children must retrieve them. Children take large steps. At each step, they say "BOOM!" You may use musical instruments to sound out the steps. Use pictures of dinosaurs. Laminate and cut them into three pieces each: head, body, and legs. Children discover new dinosaur families. Have children choose pictures of dinosaurs which you have found in magazines beforehand. They glue their pictures on heavy cardboard and cut them in different-sized pieces. They will love their homemade puzzles! Draw dinosaur feet and laminate them. Follow the footprints throughout the daycare. Where the footprints end, children find a bin of plastic dinosaurs. Place a basket full of large plastic eggs in the center of a circle. You may paint colorful spots with acrylic paint prior to the activity. In each egg, inscribe a simple activity (jump, dance, raise one leg, etc.) Play music and have children pass the basket around the circle. When the music stops, the child holding the basket opens the egg and acts out the instruction. Provide a large bin to which children may add sand, water, pebbles, leaves, grass, and small branches. Encourage them to build a dinosaur park by creating streams, mountains, volcanoes, trees, etc. Use oval-shaped candy to represent the eggs. Lightly crush the noodles, reserve. Melt the chocolate chips and the butter in a casserole over low heat or in the microwave. Add the noodles. Combine until all the noodles are coated with chocolate. Using a spoon, deposit small quantities of the mixture onto waxed paper. Delicately arrange candy in the center of the nests. Let stand until the chocolate has hardened once again. Refrigerate until ready to serve. Makes 30 nests. Children paint a dinosaur onto tactile paper using chocolate pudding. When the paint has dried, add googly eyes. Display a large plate filled with lettuce and hard boiled eggs in the center of the table. Children remove the egg shells themselves. Provide each child with a sheet of paper and markers. Beforehand, draw a starting point on each sheet of paper. Children must create a dinosaur from the predetermined point. Make a collage using egg shells on a black piece of construction paper. Build dinosaur skeletons using toothpicks on black construction paper. (Open model dinosaur - craft) Print a craft for each child. Children color the different parts and glue them onto an empty toilet paper roll. Using modeling dough, make an impression of children's hands or feet. Allow to dry before painting. 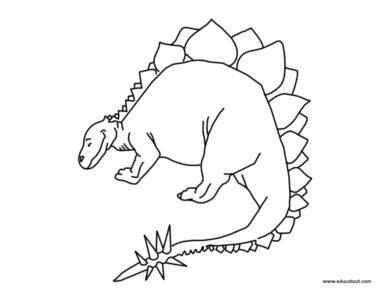 Print dinosaur coloring pages. Children trace the contour of the dinosaur using toothpicks and white glue. Sprinkle with fine sand or sparkles and remove excess. (Open sequential story - dinosaurs) Print the story. Laminate and cut out. Children recreate the story in chronological order. Joanne Arsenault carries us into the marvelous world of dinosaurs. 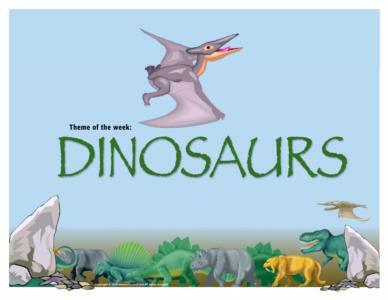 This week, children become paleontologists (person who studies dinosaur bones and fossils). Hide the plastic dog bones in the sandbox. Provide children with a paintbrush to remove the dust (sand) and a magnifying glass to examine the bones they find. Children make impressions in modeling clay with plastic dinosaurs. Allow children to sprinkle the tracks the dinosaurs left behind with the salt shaker filled with flour. With their paintbrushes and magnifying glasses, they remove the flour to discover fossils. If the sandbox is not frozen, children make impressions in the sand with their boots. They try walking like penguins, walking with one foot behind the other, walking on tiptoes, and taking giant steps like dinosaurs. Compare the impressions. Show children the difference between the two objects (size). Explain that dinosaur eggs were much bigger than the balloon and that, with the largest dinosaur egg, we could have made an omelet for 35 people. Trace the shape of a fairly large egg on white construction paper. Draw lines to divide the egg into four puzzle pieces. Using markers or crayons, children color their eggs, cut out the contour, and then cut on the lines drawn inside the egg. Have them enjoy their puzzle by then reconstructing it on a piece of colored construction paper of their choice. Have a dinosaur egg hunt. Cut out several eggs of the same size in construction paper of different colors. You must have 2 red eggs, 2 orange eggs, 2 blue eggs, etc... Hide one egg of each color in the daycare (on walls, on the floor, on large toys, etc.). Place the second egg of each color in a bag or box decorated for the theme. Children each pick one egg and search for the other egg of the same color. You may try the same game with eggs of different sizes, yet still the same color. Study the dinosaur books with the children. Ask them questions. What did dinosaurs eat? Some dinosaurs were herbivores and ate only plants, fruit, and flowers. Other dinosaurs were carnivores and ate insects, eggs, reptiles, and mammals. Were dinosaurs small or big? The smallest dinosaur was 1 meter long and weighed 3.5 kg. It was the compsognathus. The dryosaurus was 3 to 4 meters long, the nodosaurus was 5.5 meters long, the triceratops was 9 meters long and 3 meters high, the tyrannosaurus was 14 meters long, and the mamenchisaurus was 22 meters long. The longest dinosaur was the diplodocus. He measured 23 meters long. The tallest dinosaur was the brachiosaurus which was 15 meters high. Dinosaurs were as long as a house, sometimes even two or three houses or as long as the entire street. Did all dinosaurs look the same? Use books to show the differences. There were dinosaurs with horns and large ears such as the triceratops, dinosaurs with a ring around their heads such as the dilophosaurus, and dinosaurs with small heads but very long necks such as the brachiosaurus. Trace a large dinosaur model twice onto a paper grocery bag for each child. Children cut out their two dinosaurs. Place the two dinosaurs one on top of the other and staple the contour, leaving a space to stuff the dinosaurs' stomach with tissues. Once stuffed, staple completely closed. Children paint their dinosaurs as they wish. Supplies: Sandbox, rocks, plastic miniature trees, plastic dinosaurs, empty tissue box cut in two (to create caves), broken egg shells which have been washed, modeling clay to shape tiny dinosaurs which can be inserted into plastic eggs, small plastic containers to make ponds or lakes. Make materials readily available for the children. Allow them to create their dinosaur park as they imagine it. Steps - Following the beat of a drum, children take giant steps or tiny mouse steps. When the drum plays loudly, they must take giant steps, and when it plays softly they must take tiny mouse steps. Children respect the rhythm. Once they are used to the game, choose a child to play the drum. Lay different types of fruit, a plate, and a plastic knife and fork on the table. Ideal fruits are bananas, strawberries, oranges, cut pineapple pieces, and melon. Use them to make a model dinosaur. To create the body, you may use a slice of melon. Use banana pieces to make the legs. Cut strawberries into triangular shapes to represent the points on the dinosaur's back. Make a tail out of a piece of pineapple and a head out of a slice of orange, etc. Children use fruit pieces to make their own dinosaur-shaped snacks. Close the week with a "Barney" movie.